I got The Masterplan (by SharkPunch) as a surprise game in the December (or is it January?) Humble Monthly Bundle. I must admit, I had never heard of it but one of my new year resolutions was to try to play more games and blog more about gaming in-general so well… here I am! I’ve only played the first few missions but I can already see that this game has lots of potential. 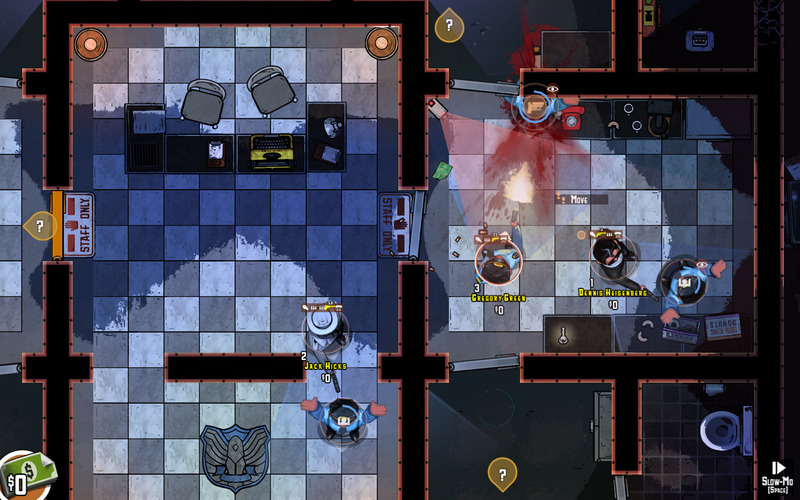 The game consists of you controlling Joey and his ‘colleagues’/goons on a number of heists with the aim of making money in order to fund even bigger heists. You have a number of actions at your disposal with more becoming available as you pick up more items from the environments. Some items can be found lying around others have to be extorted from a number of NPCs which you come across. The NPCs themselves exhibit scripted but intelligent behaviour. In one mission I had to wait for a mini market clerk to visit the toilet in order for me to hold him at gunpoint while Joey’s brother punched him relentlessly in order to knock him unconscious. This happened in the toilet so that the mini market customers could not see what happening and notify the police from the phone boot outside. All this happened after Joey’s brother sneaked in one of the backrooms and disabled all the cameras by bashing the camera panel… and so on and so forth.I guess the game can be described as a tactical real-time strategy game where your resources are limited and every action counts. The view is top-down and is similar to games such as the original GTAs and the Hotline Miamis. What differs from these latter two is that you can take control of more than one character in The Masterplan and sometimes even force NPCs to do actions for you while they are held at gunpoint. In this respect this game is more similar to games such as Commandos and Frozen Synapse. A nice feature of The Masterplan which I have to yet learn how to use properly is Slow-Mo mode. The game has two speeds: Slow-Mo and Normal speed. In Slow-Mo you can issue commands and the NPCs move at a more manageable speed. That said they do still move so you can get punched even while in this mode. This is something I need to explore more as it gives you more time to execute the perfect heist. Each mission has a total number of cash you can obtain from the establishment you are trying to rob. If a heist fails or you fail to obtain all of the cash you can try again. The game attempts to be ‘politically correct’ by giving you an incentive not to murder people unnecessarily: an unconscious shop keeper is better than a dead one! Now for a few faults: I found the controls a bit clunky but that can be attributed to me not having learned the hotkeys yet. I also saw a number of UI-related bugs but these were minor and did not break the game. Finally, I encountered a crash when I attempted to replay a heist but no progress was lost. You can push and pull the projectile allowing you to maneuver it into position. As you fill up on brick debris you fill up a meter which allows you fire a barrage from your paddle. Your paddle is NOT safe. Certain bricks come towards you and you have to shield yourself using an ability you have. You can release as many projectiles as you wish based on the number of lives you have. This grants extra bonuses.